Jan Pauel joined our motley crew in 2006 and quickly became one of our more valuable assets. Since then, he has joined us in many, many caves. Jan is a Jamaican national, and although currently a Kingstonian, has much experience with being in the bush. His outdoor skills transferred well as he tackled caving - he readily adapted to being underground, and wasn't troubled by using vertical gear. 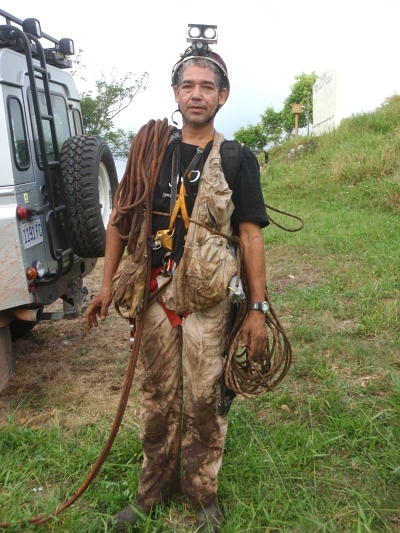 His physical attributes (that is, being good on his feet and used to rough-ground), are accompanied by intelligence, and a natural sense of curiosity, resulting in the exact qualities required in a top-notch caver. Jan's above-ground interests include scuba-diving and snorkeling (a self-described fanatic about this), boating, motorcycling, the environment, human rights, and a fascination for Jamaican architecture, natural history, and cultural history. He spends most weekends exploring every road, trail and path in Jamaica, or out on the clear blue waters of the south coast in the Portland Bight exploring the wetlands, cays and coral reefs. On those weekends that he can't get out, he spends his time at home getting equipment ready for the next weekend, and grilling various sized animals (this accompanied, of course, by the quaffing of cold Red Stripe). The JCO was very lucky to have had Jan link with us (although this is perhaps not luck, but destiny), and we hope to have him onboard for many years to come. Jan can be contacted via email at janpauel@jamaicancaves.org . Please include something in the subject that will distinguish it from the spam, such as "JCO".